Perhaps I'm in the minority, but I really don't care for the title of this Queen/Freddie Mercury biographical film. I just feel it's so on the nose and about as subtle as a brick to the face. It just comes off as such a lazy, unoriginal and meaning-devoid title. Very marketing-based. So, I figured some of us could try our hand at some other titles? Here are the only ideas I've got in my tired state. I'm sticking to the theme of using song titles but feel free to deviate. -"Killer Queen" - It's one of their hits, but also could describe both the band as being "killer" and also be descriptive of Freddie who was that adjective as well as a bit of a queen. Not the most original - but certainly more meaningful than the title we got. -"Spread Your Wings" - Just like that it's about a band/artist soaring to success. -We Are the Champions" - Again, contrived and lazy. But still makes more sense, to me. Anyone here have any ideas? Anyone feel the same way I do about the official title being...lazy or not fitting? 'Love Me Like There's No Tomorrow - The Freddie Mercury Story"
We've had 'A Night at the Opera"....perhaps they could have gone for 'A Night At The Cinema" (or Theater if you're from the US)!!! Makes only limited sense, but would be fun though. Guten Morgen, sie wünschten geweckt zu werden. I'd say Freddie Mercury - Singer Of Songs. I don't mind the title too much. Lacking subtlety? Maybe, but it is Freddie and/or Queen we're talking about here, after all. "Subtle" isn't really a word that I associate with them, ya know? But if you want a different name....maybe naming it after a song Freddie didn't write would be kinda weird, but These Are The Days Of Our Lives wouldn't be a bad title. Or how about Who Wants To Live Forever? Or (and I think this was a Freddie song) Was It All Worth It? I think the title "Avengers versus Justice League" would really shift some tickets. I fully agree. They'll never change it now as it's far too late in the day but never liked 'Bohemian Rhapsody' as a film title... completely lacking in imagination and what does it even mean? A Kind Of Magic would've suited the film well. Maybe a little too cheesy for some but it works as Queen and Freddie himself always have/had an otherworldly aura tom them/him. Like it or not Bohemian Rhapsody is arguably the most famous song title ever and will be forever associated with it's creator! I'm not saying its a great title for a movie but I can see why they used it. It's so recognisable and synonymous with Queen, you know when you see it there's got to be a connection with Freddie. The formula worked with the musical as WWRY again is just so recognised and forever associated with Queen. slightlymad1970 wrote: Like it or not Bohemian Rhapsody is arguably the most famous song title ever and will be forever associated with it's creator! I'm not saying its a great title for a movie but I can see why they used it. It's so recognisable and synonymous with Queen, you know when you see it there's got to be a connection with Freddie. The formula worked with the musical as WWRY again is just so recognised and forever associated with Queen. Exactly! Bohemian Rhapsody is immediately associated with Freddie and Queen and no other entity, so it is the perfect title. It is the song or rhapsody of Freddie’s life! It is the most unique song ever created and Freddie was a unique man in so many ways! ultrasoundz wrote: I fully agree. They'll never change it now as it's far too late in the day but never liked 'Bohemian Rhapsody' as a film title... completely lacking in imagination and what does it even mean? Bohemian Rhapsody works perfectly for the film. Here's what it means. Bohemian - a person who has informal and unconventional social habits, especially an artist or writer. Sounds like Freddie to me. Rhapsody - a free instrumental composition in one extended movement, typically one that is emotional or exuberant in character. While this describes music, put into the context of the film's story, I think it works well. An emotional coaster ride, and we've got one exuberant character in Freddie. 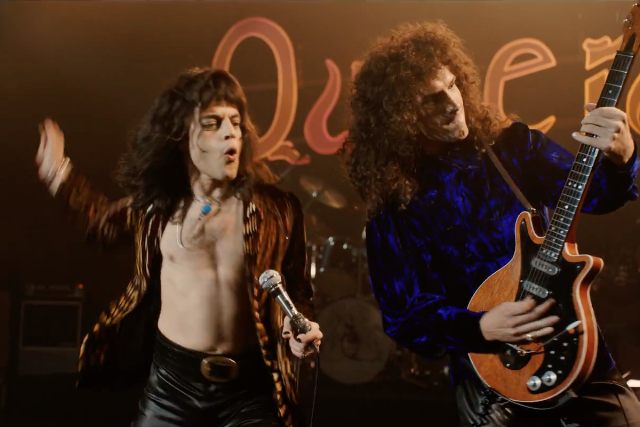 Given the meaning of those two words, and the song's overwhelming popularity and association to Queen, and particularly Freddie, I think they'd have been crazy not to call the film Bohemian Rhapsody. And believe me, I was originally in the camp that found the title distasteful. But it works, and will undoubtedly reach the most amount of people. A very smart commercial move, yet it still describes the contents of the film. Perfect, if you ask me.